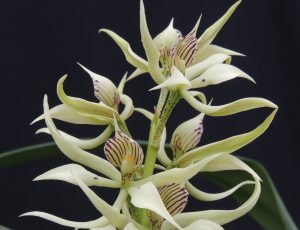 There is a new scent filling the greenhouse this week thanks to this wonderful species. 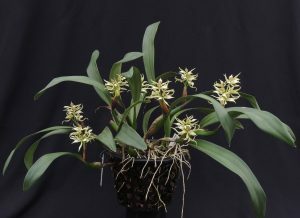 Prosthechea aemula is a vigorous grower with 15cm pseudobulbs and 25cm long dark green leaves produced each summer and long lasting sprays of up to nine flowers from each pseudobulb in early spring. This plant shown is the largest division from the plant we posted last January (see last years photo below) and it is great to see how well it has grown since dividing. This large plant has become more than fifteen plants all now flowering together and clearly appreciating the extra space, light and fresh compost that division provides. 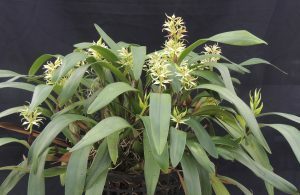 This species is native to warm, wet forests over a wide range through Central and South America and we find it thrives in our Warm Americas section (min 15C) especially in baskets where plants can have heavy watering but excellent drainage. 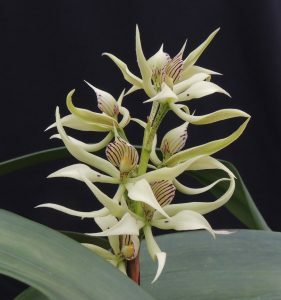 The scent is described by orchid project students as a mix between white chocolate and play-doh and is really rather nice though potentially a little overpowering with all the plants we have flowering today. Thank you for the identification ! I saw this in Costa Rica at Chilamate Rainforest. It was growing on a tree about 10 feet high in the grounds of Chilamate Rainforest Eco-retreat. That sounds lovely – do you have a photo of it in-situ? I’ve sent a few photos across via email. Hopefully they will all come through ! Indeed, it is a powerful and lovely scent. Thanks for your input. I’m glad that your nose agrees with my nose.